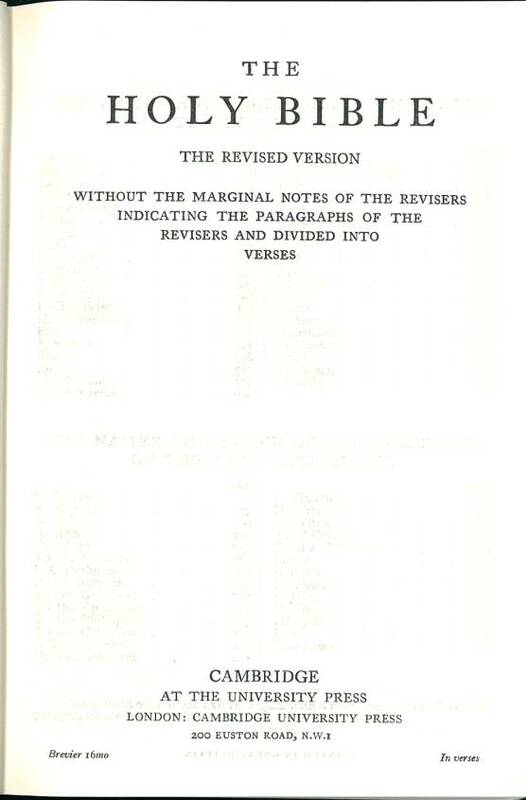 Click here for sample verses from the English Revised Version. 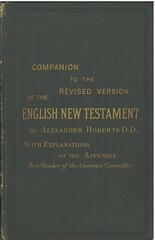 Comments: The words "American Edition" appear on the spine of this volume. 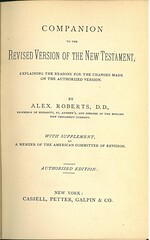 The text is the Revised Version of 1881, but the American preferences are incorporated as footnotes instead of appearing as an appendix. 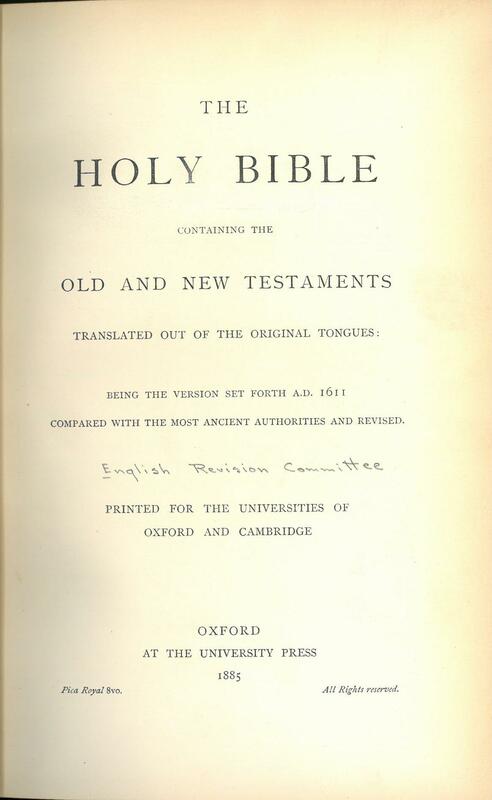 Title: The Holy Bible Containing the Old and New Testaments with the Apocrypha Translated out of the Original Tongues: Being the Version set forth A.D. 1611 Compared with the most Ancient Authorities and Revised. 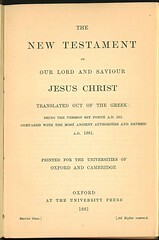 Printed for the Universities of Oxford and Cambridge. 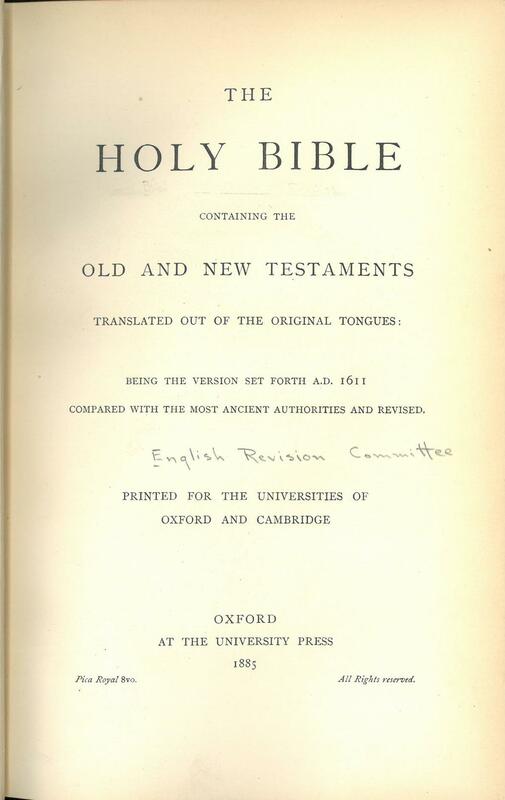 Contents: Old Testament in four Volumes. 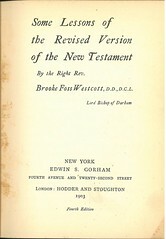 Volume 1 - Genesis to Ruth, Volume 2 - 1 Samuel to Esther, Volume 3 - Job to Song of Songs, and Volume 4 - Isaiah to Malachi. 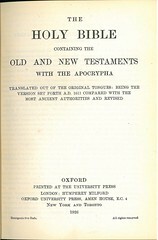 Comments: Despite the Title , this is only the Old Testament. 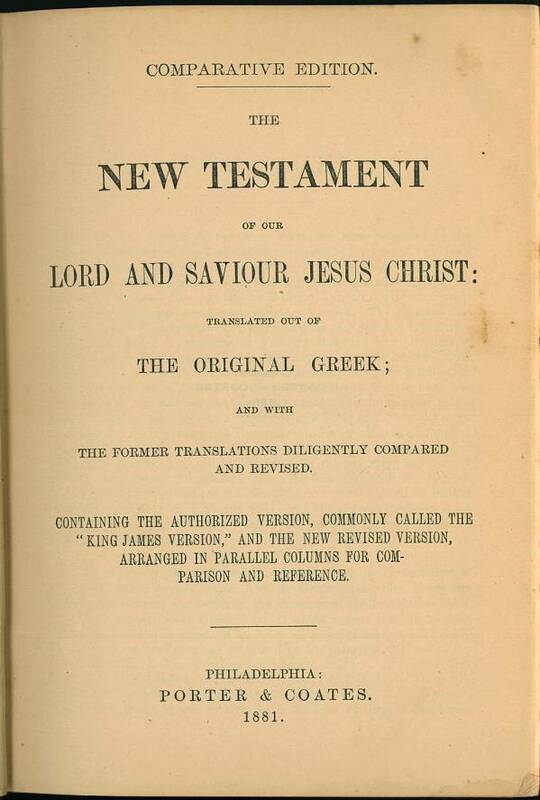 Along with the New Testament published in similar format in 1885, it forms a complete Bible. 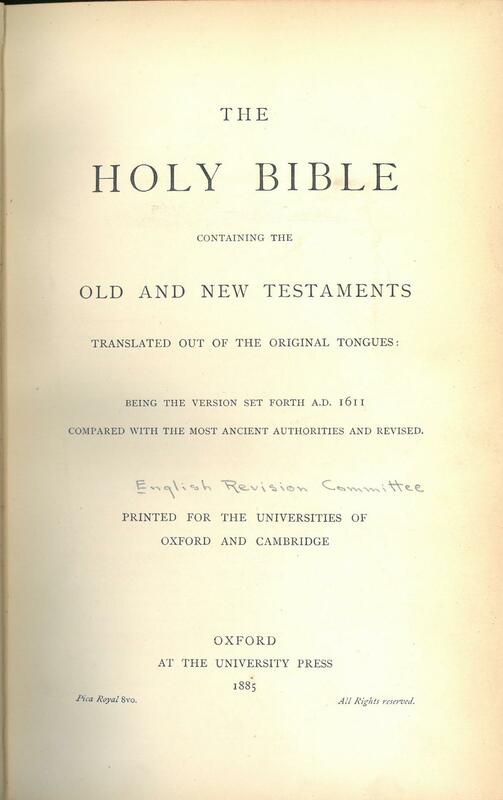 Title: The Holy Bible Containing the Old and New Testaments with the Apocrypha Translated out of the Original Tongues: Being the Version set forth A.D. 1611 Compared with the most Ancient Authorities and Revised. 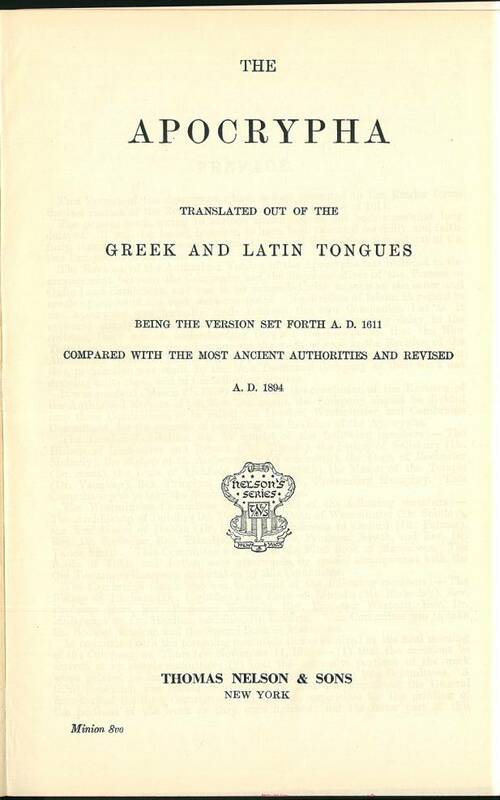 References: Chamberlin p. 29-2, Taliaferro-EELBV 7585.110. 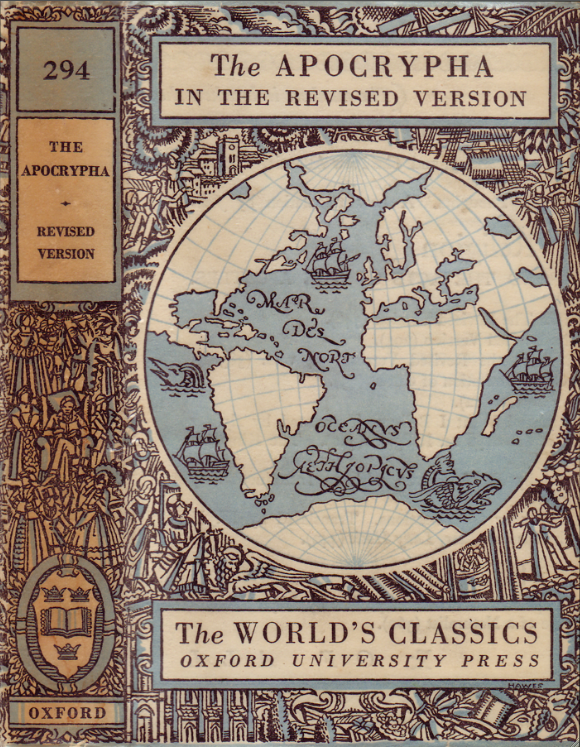 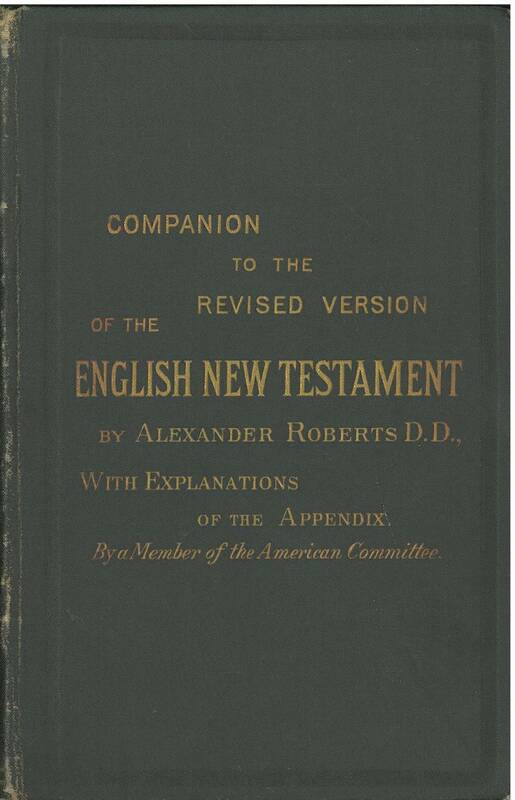 Comment: A late 20th century reprint of the English Revised Version Bible. 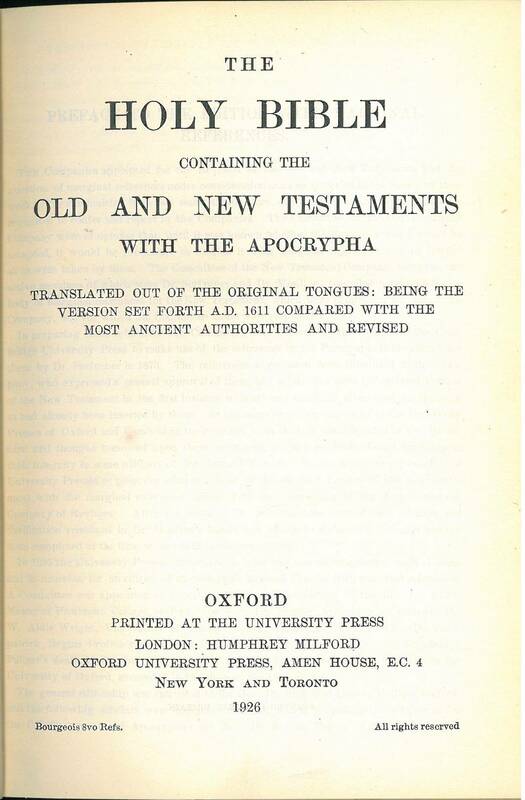 References: Chamberlin p. 29-2; Herbert 2061, Taliaferro-EELBV 7585.120. 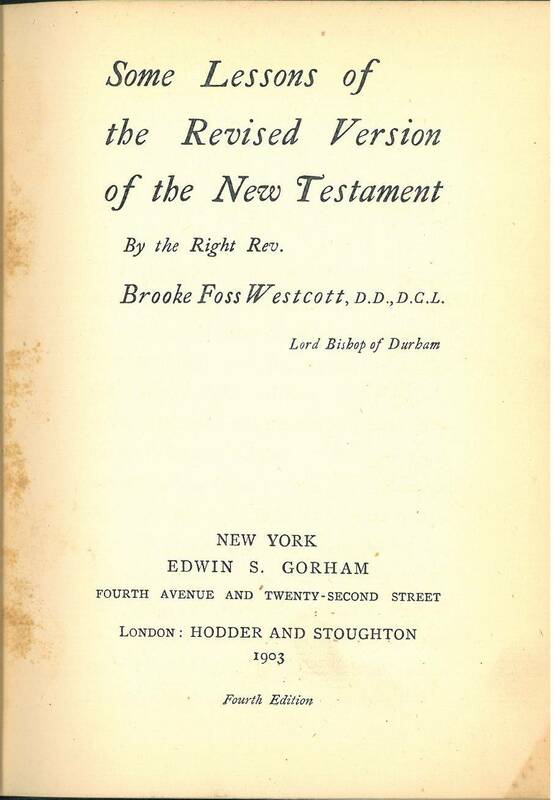 I & II Esdras; Tobit; Judith; Rest of Esther; Wisdom of Solomon; Ecclesiasticus; Baruch w/ Epistle of Jeremia; The Song of the Three Holy Children; History of Susanna; Bel and the Dragon; Prayer of Manasses; I & II Maccabees. 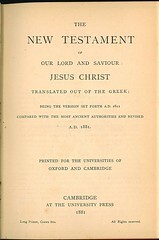 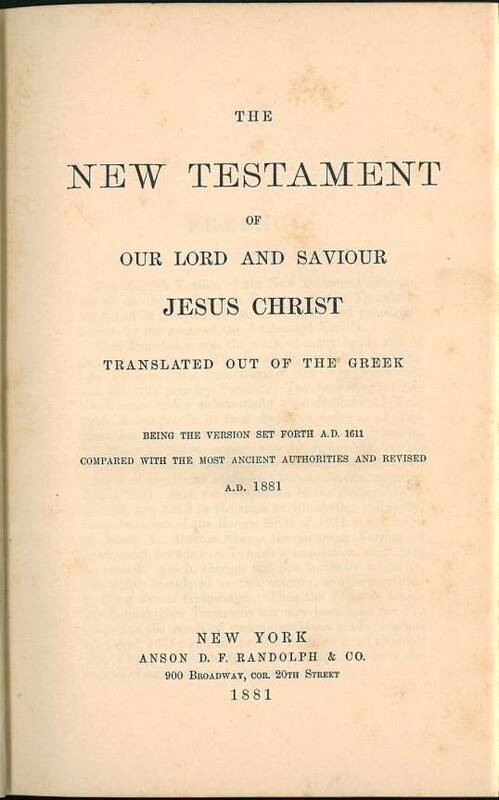 Very soon after the Revised New Testament appeared in 1881 various parallel editions were published that had the new version in a parallel column with the King James Version. 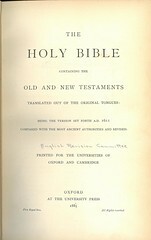 After the Old Testment was published in 1885, complete parallel Bibles appeared. 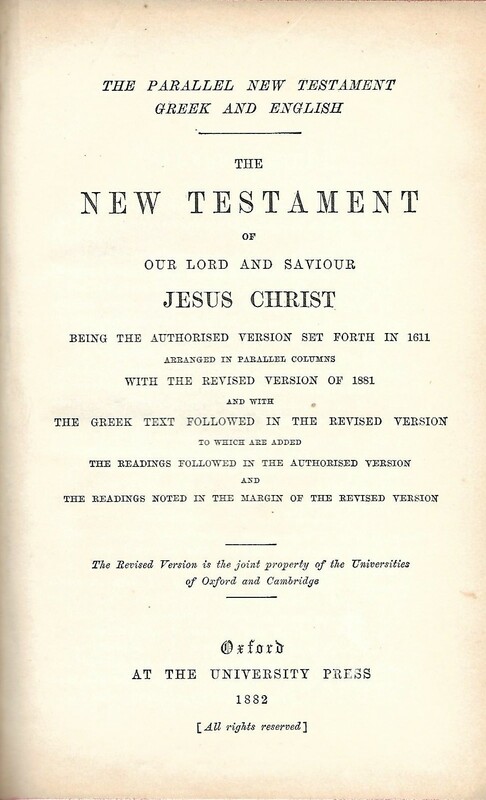 In 1910, an "interlinear" Bible was published that showed the two texts with words in common to both versions in large letters and where the two versions differ, both were printed in smaller type; the Authorized Version on the bottom and the English Revised Version on the top. 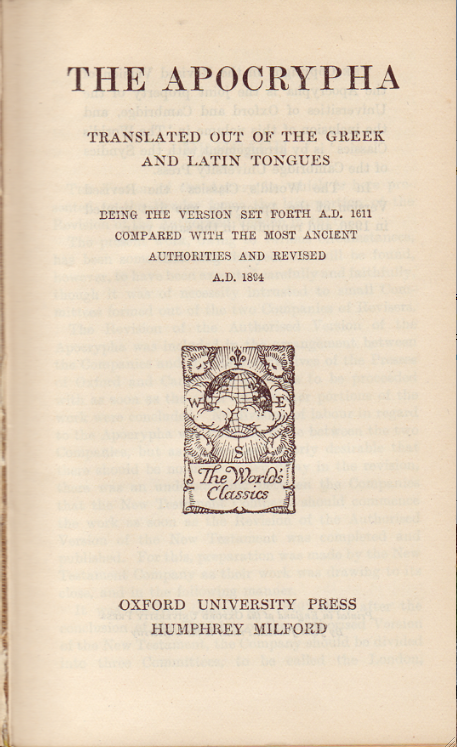 Title: Comparative Edition. 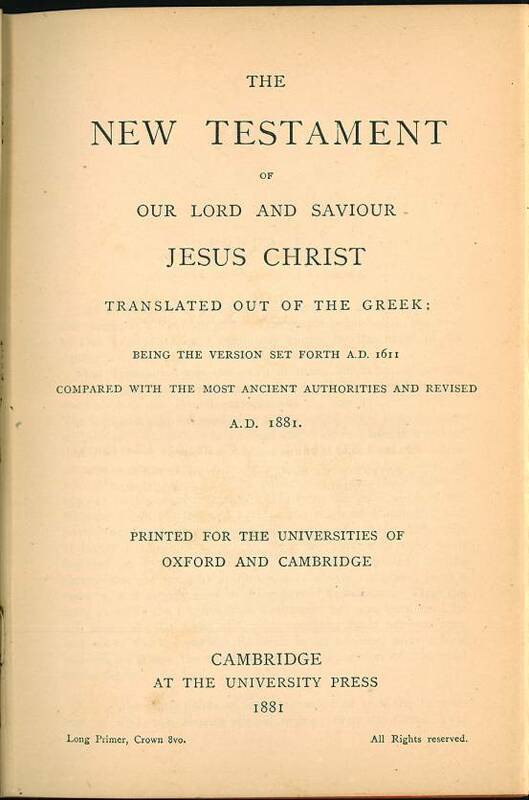 The New Testament of our Lord and Saviour Jesus Christ: translated out of the original Greek; and with the former translations diligently compared and revised. 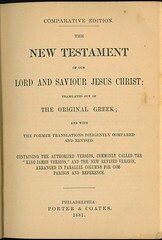 Containing the Authorized Version, commonly called the "King James Version," and with the new Revised Version, arranged in parallel columns for comparison and reference. 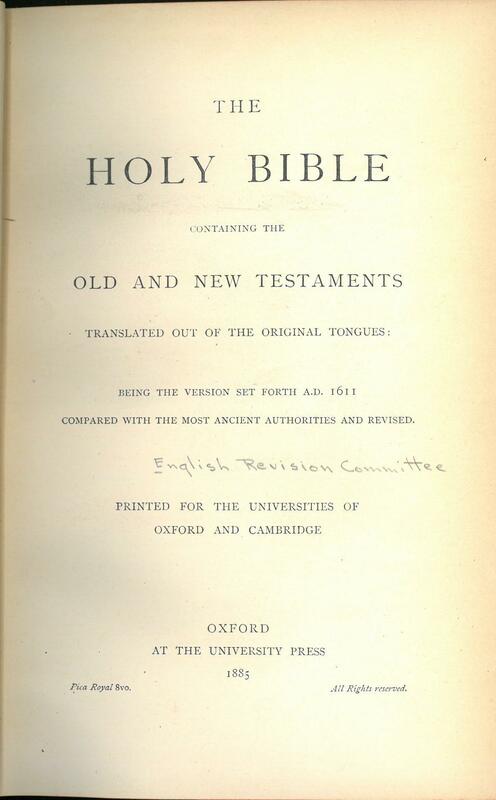 References: Chamberlin p. 561-3, Taliaferro-EELBV 7585. 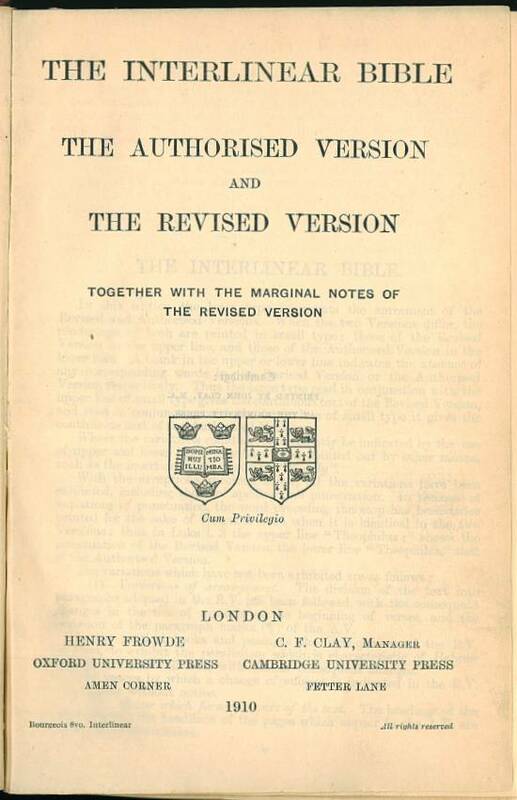 References: Chamberlin p. 29-2; Herbert 2143, Taliaferro-EELBV 7585. 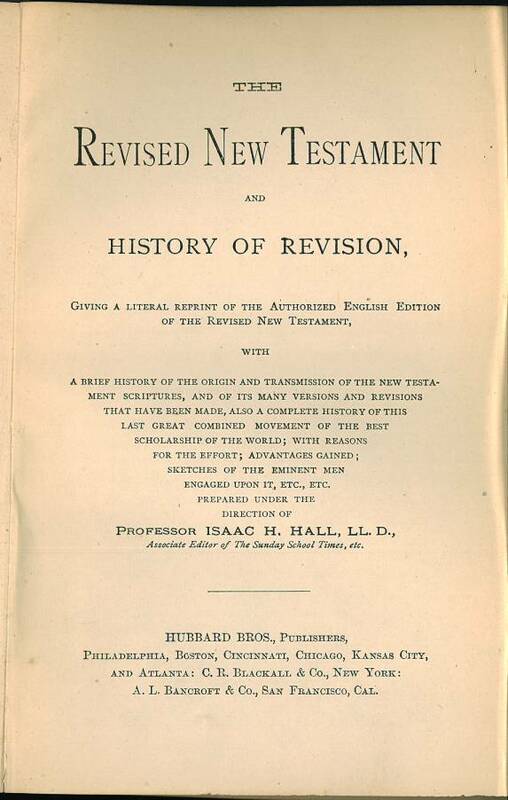 Title: Companion to the Revised Version of the New Testament, Explaining the reasons for the changes made on the Authorized Version. 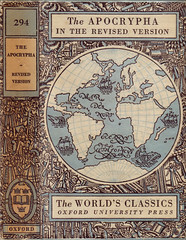 By Alex. 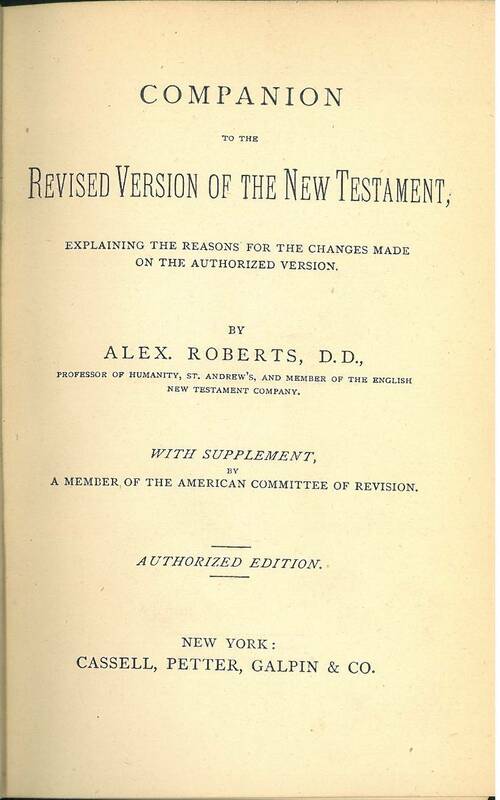 Roberts, D.D., Professor of Humanity, St. Andrew's, and Member of the English New Testament Company. 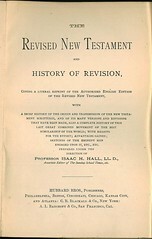 With Supplement, by a member of the American Committee of Revision. 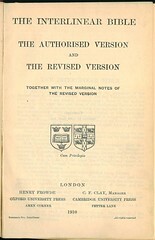 Authorized Edition. 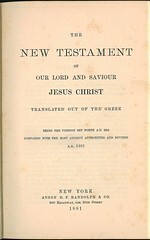 Publisher: New York: Cassell, Petter, Galpin & Co. 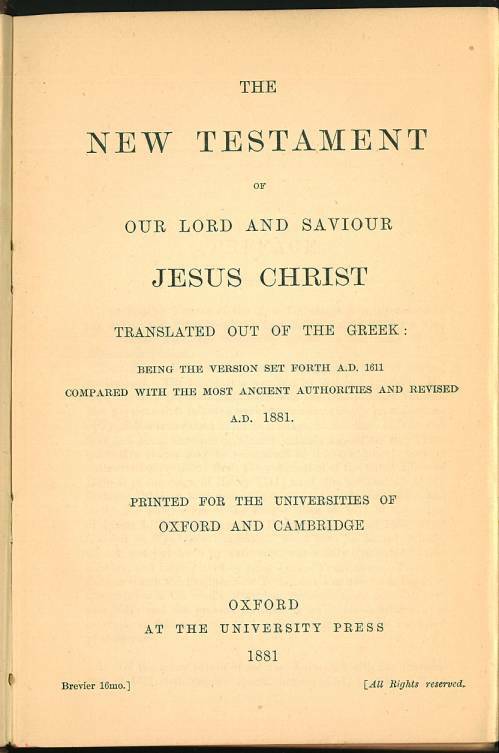 Comments: The greater part of the contents of this volume appeared in the Expositor for 1887. 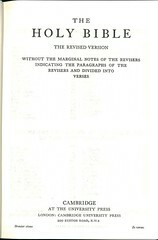 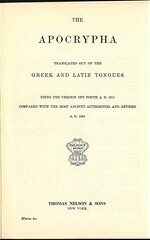 Facsimile: A PDF facsimile of the 1897 edition is available at archive.org.